As Fa'ya'yo looked around the room, trying to decide where to go, he felt a glooming despair. Where is the center of this place? What am I doing? He turned around, thinking he might be going in the wrong direction. He saw a small movement in the corner of his eye. A small eye was hiding I the shadows to his right. "Well, you are an ugly one!" The faun pointed his ironwood staff towards the center of the horrible little creature. A faint humming sound filled the room, coming from the orange crystal in the top of his staff. "I doubt a little beholder like you has dealt with Faun magic before!" The eye began to shriek and slowly headed towards the middle door. "Lets see where that door goes!" Pit skill 6 + dice 6 = 12. Astrid skill 8 + dice 6 = 14. Pit loses 2 danger. 11 remaining. Pit magic 4 + dice 6 = 10. Astrid magic 6 + dice 5 = 11. Pit loses 1 danger. 10 remaining. Pit strength 3 + dice 1 = 4. Astrid strength 2 + dice 1 = 3. Astrid loses 1 health. Astrid skill 8 + dice 1 = 9. Astrid loses 3 health. Pit magic 4 + dice 3 = 7. Astrid magic 6 + dice 3 = 9. Pit loses 2 danger. 8 remaining. Pit strength 3 + dice 5 = 8. Astrid strength 2 + dice 3 = 5. Astrid loses 3 health. Pit skill 6 + dice 3 = 9. Astrid skill 8 + dice 1 = 9. Even. Pit magic 4 + dice 5 = 9. Astrid magic 6 + dice 1 = 7. Astrid loses 2 health. Pit strength 3 + dice 2 = 5. Astrid strength 2 + dice 3 = 5. Even. Astrid skill 8 + dice 6 = 14. Pit loses 2 danger. 6 remaining. Pit magic 4 + dice 2 = 6. Astrid magic 6 + dice 5 = 11. Pit loses 5 danger. 1 remaining. Astrid strength 2 + dice 2 = 4. Astrid loses 1 health. Pit skill 6 + dice 2 = 8. Astrid skill 8 + dice 1 = 1. Pit loses 1 danger. 0 remaining. After plucking the herb, Elias decided that he will go straight. In other areas of the labryinth wizards, ninjas and other warriors continued their quests without confrontation, but we return to the fate of a plucky young faun, who had encountered the 'eye of despair. Would even his natural optimism hold out against such a crushing force of evil? Fa'ya'yo magic 5 + 1 = 6. F'y'y loses 2 health. F'y'y skill 5 + dice 2 = 7. Eye loses 1 health. F'y'y strength 4 + dice 2 6. F'y'y loses 2 health. The eye retaliated, lashing out a the faun with it's sharp tentacles. F'y'y magic 5 + 6 = 11. Eye loses 1 health. Fa'ya'yo was wounded but still managed to cast out a small spell, confusing the evil eye for a moment. eye strength 2 + dice 3 = 5. F'y'y strength 4 + dice 6 = 10. With one final strike the eye began to shriek and wither and slowly headed towards the middle door. "Lets see where that door goes!" said the faun, unbowed by his recent scrape with the eye of despair. Rulf the Orange exited the chamber where he had slew the imp and took the door to his left. He entered another almost identical chamber. There were four doors this time, one straight ahead, one to his left, another to his right, and the one behind him that he had just moments ago passed through. He felt as if he was making good headway, it seemed a step in the right direction. He adjusted the grip on his sword, something was not right. He felt uneasy, and an unsettling breeze blew through the chamber. Blocking his path, in the centre of the room, was what looked like a pile of rubble. Stones that had perhaps fallen in from the ceiling. He looked up, but the chamber's ceiling seemed intact. Sling Mau rests and gains 1 health. You may enter an in forum comment as to your next destination or PM. It must have been the time to stumble upon dead bodies, as in another part of the maze the sage, or The Doctor, as he preferred also continued straight and found in the centre of his room a recently dead goblin. The room had three doors, the one he had entered through, one to his right and a wall to his left, as if he also, like the Ninja Sling Mau was skirting the edge of the labryinth. "I must be skirting the edge of the labryinth in a anti-clockwise direction" he thought to himself. The Doctor rests and gains 1 health. You may enter an in forum comment as to your next destination or PM. Mau paused an instant to speculate. The best thing would be if he could go right and then straight to the center of the maze, but that sounded too easy. Plus, someone had clearly gone that way recently, and it was risky to follow. But he wasn't going to back off becuase of some unknown foe, rather he hoped he could follow in the other's footsteps and avoid all the other threats that way, so he slipped off to his right. After the fight, Rulf will go forward. Rulf knew that his best chance of survival was attack, and so leaped at the golem with all his might (strength 6 + dice 5 = 11). The golem reeled back in surprise and attempted a swing at the knight (strength 5 + dice 3 = 8. Golem takes 3 damage, 10 health remaining). The golem, crumbled and reformed, swinging again at the knight from a different angle (magic 4 + dice 5 = 9), but Rulf had sensed the attack and parried the creature's devastating swing (magic 5 + dice 6 = 11. Goldem takes 2 damage). Rulf took advantage of his upperhand and struck swiftly with his sword (skill 4 + dice 6 = 10. Golem skill 4 + dice 2 = 6. Golem takes 4 damage). The knight's seasoned muscles bulged and flexed as he dealt the monster another blow (strength 6 + 5 = 11. Golem strength 5+ dice 5 = 10. Golem takes 1 damage). Enraged the golem yet again crumbled and reformed behind the knight (Golem magic 4 + dice 4 = 8) but the knight's experience and instinct held, and he defended the attack (magic 5 + dice 5 = 10. Golem takes 2 damage. 1 health remaining...). Rulf could feel that victory was in his grasp, but he was beginning to tire, his age catching up with him. He paused for second too long and the Golem struck (Golem skill 4 + dice 6 = 10. Rulf skill 4 + dice 4 = 8. Rulf loses 2 health). The Golem batted the knight with his large rocky fist and Rulf stumbled to the floor. Summoning the last remains of his strength, the veteran warrior launched himself at the Golem with one final roar! (Strength 6 + dice 4 = 10. Golem strength 5 + dice 2 = 7... Golem takes 3 damage...). The warriors sword struck a crack in the Golem and a piercing light filled the room. The Golem fell down dead, or as dead as a pile of rocks can be. The knight kicked one of the rocks just to make sure, it clattered across them room. Whatever sorcery there had been, was gone. Rulf dusted himself off and headed for the door straight ahead. Rulf loses 2 health but gains 1 luck for a successful task. 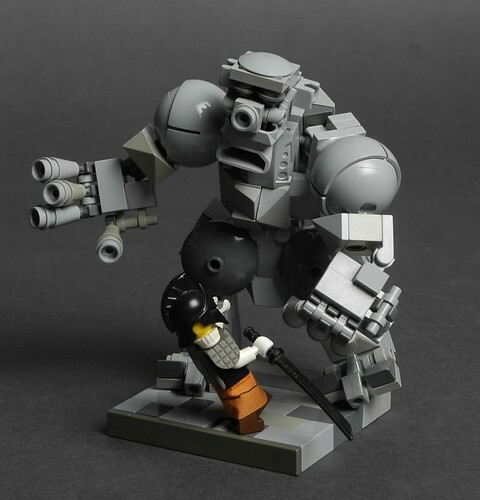 I really like the MOC, even though it was a little late (and is it just me, or are the Golem's thumbs upside down? ), so I'm going to give 2 gold. This is definitely not a task for the faint of heart, said the doctor. I hate seeing any living creature dead. I need to get out of this room. And with that the doctor takes the door to his right. Last Edit: Aug 1, 2016 0:18:15 GMT -8 by andhe: edited for stats. Elias the Wizard had left a dead goblin, a dead imp, and a battle with someone unknown sorceror (who had also vanished into thin air) all behind him. He felt he was making good headway towards the centre of the maze, but wasn't fully prepared fror the next challenge that awaited him. He entered a room identical to the one where he had found the grumbleweed. Four, one straight ahead, one to his right and left and one behind him that he had just passed through. As warrior not unfamiliar with magic, he immediately sensed a dangerous presence. A force in the room that saught to cause him harm. Out of the shadows, its fangs dripping, its claws scraping on the cold stone floor, its tail lashing from side to side... was a Vilderbeast. Merc, please submit your points in the forum using a short story. You may also include a small 8x8 MOC if you wish. Once you've done this I'll crunch the numbers and write up the result, then move on to the next player. Deadline - Monday! Meanwhile, in two other parts of the labryinth, a portly Barbarian and a warlock also continue their quests. Drinlarr and Malekk both enter rooms with four walls, a door on each and nothing much else to see. Drinlarr decides to rest (+1 health) seating his stout frame onto a rough hewn stone. Malekk finds some food, if you can call shadow mushrooms 'food', but they would give him sustenance while he decide which way to go next (+2 strength). Ak and Drakk, please submit your next turn decision in the forum using a short story, and MOC if you choose. Deadline Monday. Once Yorick, Merc and Fenrir submit their points this also brings us to the end of Round 4!